And Yet They Deny: Eugenics In Action: "Flu kills 27 in Britain"
Eugenics In Action: "Flu kills 27 in Britain"
Never the industry to let up on fearmongering when on the contrary it thrives on it; the media networks across the UK are giving their fair dosage of doom and gloom for us all to sink our teeth into during the Holidays. Hmmm, what shall we focus on?? : Well, there's the story of the missing young lady whose body has just been found on Christmas morning [reports are stating that she may have been strangled] - or there's the story of an apparent plot to bomb the London Eye - or how about the "severe" rate of deaths caused by the seasonal influenza virus and its variants? Flu has killed 27 people in Britain since the influenza season began in October and transmission of the virus is picking up across the European Union, health officials said on Thursday. A patient is given a H1N1 swine flu vaccination at the University College London hospital Enlarge photo Latest data from the Health Protection Agency (HPA) showed that 24 people died with the H1N1 flu strain that spread around the world as a pandemic in 2009, and three with from a strain known as flu type B. Eighteen of those who died were adults and nine were children. "The level of flu activity we are currently seeing is at levels often seen during the winter flu seasons, but due to the fact that H1N1 is one of the predominant strains circulating at the moment, we are seeing more severe illness in people under the age of 65 than we would normally expect," said John Watson, head of the respiratory diseases department at the HPA. European health experts have said other European countries should see the severe flu hitting Britain at the moment as a warning of what might be coming to them soon. "Influenza transmission is now picking up across the European Union," Marc Sprenger, director of the European Centre for Disease Prevention and Control (ECDC), which monitors disease in the region, said in a statement. The H1N1 strain is among the seasonal flu vaccines being offered across the world this year after the WHO advised it was likely to be the most dominant strain of the northern hemisphere's 2010/2011 flu season. Flu vaccines are made by several drugmakers including GlaxoSmithKline, Sanofi-Aventis and Novartis. Sprenger said the ECDC's advice was that all those who are recommended to have the influenza vaccine by their national authorities should get vaccinated as soon as possible. "Vaccines and vaccination can be an emotive issue and citizens rightly ask for assurance," he added. "The scientific evidence shows that seasonal influenza vaccines are effective and very safe. They provide a protection of up to 80 percent against influenza on an individual basis." For most people, flu infection is just a nasty experience, but for some it can lead to more serious illness. The most common complications of flu are bronchitis and secondary bacterial pneumonia. "Flu can be an extremely serious illness for people in 'at risk' groups, including pregnant women, the elderly and those with other underlying conditions such as heart problems, diabetes, lung, liver or renal diseases and those who have weakened immune systems," said Watson. 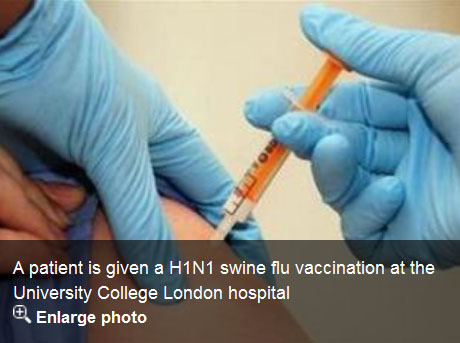 Health officials said on Tuesday that more than 300 people were in intensive care with flu in hospitals across Britain. H1N1 flu was discovered in Mexico and the United States in March 2009 and spread rapidly across the world. The World Health Organisation, which declared the pandemic over in August, said about 18,450 people died from the virus, including many pregnant women and young people. Source: Yahoo! News via Reuters.